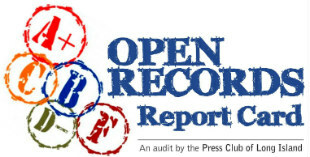 A year after the Press Club of Long Island published an unprecedented report card grading nearly 200 municipalities and agencies on their responsiveness to public records requests, some that scored poorly made improvements in how they handle Freedom of Information Law (FOIL) requests while others did not. The cumulative grade was a C in the project done by Timothy Bolger, editor in chief of the Long Island Press and PCLI’s Freedom of Information Committee chair. “We added the link to the FOIL request to the sidebar on the county website to make it easier to find/access,” legislative aide Matthew Fernando said. Besides changes in policy, there has also been changes in personnel since last year. Republican Nassau County Executive Ed Mangano, whose adminstration got an F in the report and is currently on trial for corruption charges, was replaced by Democrat Laura Curran, who promised to do better than her predecessor. On the village level, Roslyn Harbor passed new FOIL rules shortly after it got an F. Island Park publicly vowed to improve its complete lack of responsiveness. Some, such as Baxter Estates, which did not have a FOIL policy last year, produced one in a sampling this winter. LI’s 97 villages got a cumulative grade of C in the report. But not all heeded the findings. The Village of Cedarhurst, which also got an F, now prominently placed FOIL rules on its website indicating that requests must be made in person at village hall—the type of prohibitive policies that make it more difficult for the public to access records and decreases government transparency. The report and the update were released for Sunshine Week, an annual national initiative highlighting the importance of access to public records.